Mohali (Punjab, India): Bollywood’s famous playback singer Usha Timothy has said that ‘Royalty was not the main cause of 1960’s Rafi-Lata dispute. Actually its reason was another one.’ It is the first time that Bollywood’s any renowned personality has expressed such a claim. During telephonic conversation (which is now available upon YouTube also at this link: http://youtu.be/CSaoeIqLagE ) from Mumbai Ms. Usha Timothy told Mehtab-Ud-Din, a Writer & Journalist of the Punjab,”Mohd. 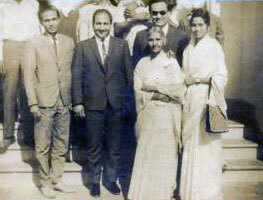 Rafi Sahib was really a nice person, the Bollywood had. He always supported the new singers just like me and Suman Kalyanpur. Lata ji might have not liked Rafi Sahib’s such type of gestures. That’s why, they were not in the speaking terms for some years.” Ms. Usha Timothy even alleged,” I think, Lata ji had lost her mental balance that she created an unwanted issue with the Great Rafi Sahib. Royalty was merely an excuse. Royalty might be an issue of every singer’s own will. If a singer had not wanted it, he might not accept it and vice versa. 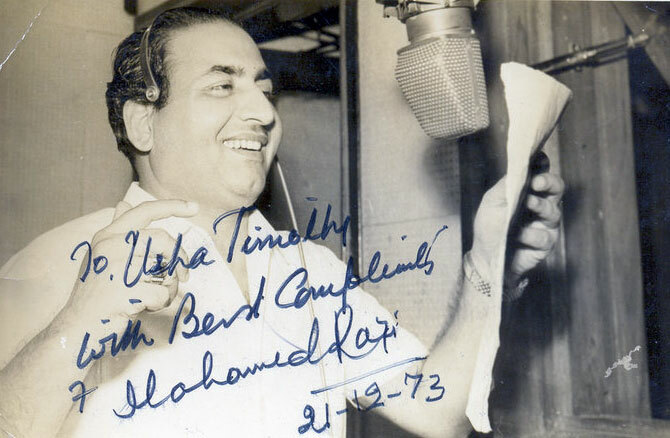 My song ‘Tu Raat Kharhi Thi Chhat Pe’ with Rafi Sahib had got a big hit in those days, while the Royalty dispute occurred. Perhaps Lata ji might have thought that Rafi Sahib is bringing unnecessarily some new playback singers like Suman Kalyanpur, Usha Timothy and others. Why is he singing with other female playback singers? I don’t think that royalty was a bigger issue ever between the Rafi-Lata dispute. Lata ji might have accepted royalty, if she wanted and Rafi sahib might not accept it willingly. Kishoreda was in favour of singer’s royalty and he always accepted. 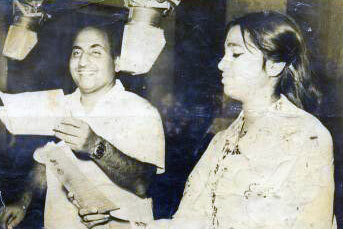 Whenever Rafi sahib and Lata ji sang together, the songs became the best renditions of Bollywood. The competition was always equal. I never understood that why Lata didi’s mind has gone upset and she created an unnecessary issue of royalty with Rafi sahib.” While in long conversation, Ms. Usha Timothy told that her first playback song was also with Rafi sahib for film ‘Himalaya Ki Goad Main’ and the song was “Tu Raat Kharhi Thi Chhat Pe… However, earlier I had sung a theme song for the film ‘Durga Puja‘, but actually those were the bhajans and no record was launched. That is why, my first song was for the film ‘Himalaya Ki Goad Main.’ I was only of 13 years old, when I sang the song with Mohd. Rafi in 1962. I was just like a kid and was studying in the 6th grade at the school. Kalyanji-Anandji told me before recording that there will be a lion before you and you must have to compete. I replied that the lion was my own as I had performed with Rafi sahib in a number of stage shows till then. I had been singing with Rafi sahib since my age of 8. But as soon as I stood before mic with Rafi sahib, I got disturbed. I was in a great tension as Rafi sahib’s singing and status was the highest and versatile in Bollywood but I was almost nothing. He was world famous. But Rafi sahib understood my confusion and consternation. He patted my head and said,”you sing very well and will sing the best with me also.” The way, he encouraged me a lot, I can’t forget even today.” Ms. Timothy, who was born in a Christian family of Nagpur (Maharashtra) on 8th October, 1949, told that she is still busy and have some assignments of singing. There are Hindi and Bhojpuri songs for some private albums and other projects. She told that she never counted that how many songs she have sung but she has sung more than 1,000 songs because she has sung for various Punjabi, Marathi, Bhojpuri, Gujarati, Rajasthani, Malayalam and other regional languages’ films in addition to Hindi ones. She described the Punjabi film ‘Kankan De Ohle’ especially. She sang for Punjabi Music Director Surinder Kohli. She said that everyone in her family, from mother-father to brothers and sisters were singers and were very fond of music Her father was a CBI officer. Usha Timothy is the youngest of her 11 siblings. Her father used to have organised big mehfills (Singing Events/Concerts) even in the home, where various Classical singers often performed. In 1956-57, there was Kalyanji-Anandji night in Nagpur; the concert became turning point in the life of baby Usha Timothy. Mr. Madhusudan had organized the musical event. The singing artists like Mohd. Rafi, Mukesh, Manna Dey and Hemant Kumar were present in it but there was not a single female singer. Thus, Mr. Madhusudan suggested the name of 8 years old Usha Timothy to Kalyanji-Anandji but while they knew the exact age of Ushaji, they outrightly rejected. But Mr. Madhusudan and his colleagues did not lose their hearts and they sent baby Usha Timothy on the stage during an interval. Then she sang the song “Rasik Balma” of film ‘Chori Chori’ and the audience had gone mad. Everyone in the audience cried and demanded more songs of Usha Timothy ji. Kalyanji-Anandji also appreciated the singing style of Ushaji and they got her services for singing in their every future concerts/nights. Then she toured every corner of Bombay (now Mumbai) and other prominent cities of India. 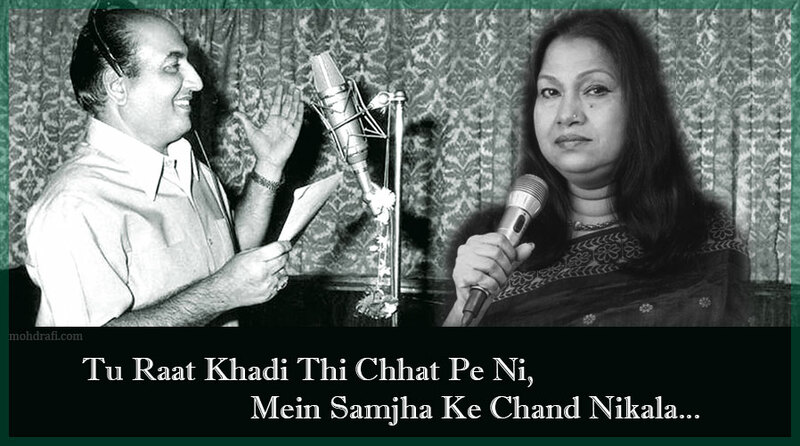 She began to sing with not only Kalyanji-Anandji’s stage show groups, but also with Rafi sahib, Mukesh ji, C. Ramchandra and Hawaiian guitarist S. Hazara Singh. She got President of India’s Award for the best playback singing in 1965. She had experienced of singing with the top singers of India like Mohd. Rafi, Mukesh (‘Dhol Baja Dhol Jania’ Film Vishwas), Kishore Kumar (‘Rafta Rafta Dekho Aankh Meri Larri Hai’ Film Kismat), Mahendra Kapoor, Shamshad Begum, Asha Bhonsle, Suman Kalyanpur, Hemlata, Krishna Kalle in a very short duration. But Ms. Usha Timothy tells proudly that she always tried to copy like Mohd. Rafi sahib, not like Lata ji or Asha ji. She said that she often suggested the newcomers to sing like Rafi sahib, if they want to be immortal in the playback singing field. “The musical notes (sur) of Rafi sahib were extraordinarily strong and every playback singer must try to just like HIM only. If Rafi sahib were alive today, his musical notes would have been the strongest even today. I had been working with Rafi sahib for almost more than 20 years and nowadays, whenever I remeber the moments, having spent with him, I often shared on the Facebook. Bollywood’s Music Directors used to honour the best singers every year in the 1960s and that award was presented by Rafi sahib to me. Those moments are the treasure of my life.” Ms. Usha Timothy also admitted that she got some benefit to sing with Rafi sahib only due to his dispute with Lata ji. The ustad (teacher) of Ms. Usha Timothy in playback singing remained always one and only Mohd. Rafi sahib. He taught her to understand the real emotions of the lyrics and also explained how to control upon the breathing while singing. He also elaborated to her how to provide the touches of acting while singing. Usha Timothy ji told,”My chemistry with Rafi sahib was so intact in real life also. That is why, when he died in July 1980, there was a rumour in the Bollywood that Usha Timothy has given up playback singing, which was wrong.” Usha Timothy ji is still active in her stage shows. She is living in Mumbai with her son Abhijit Chandekar and daughter-in-law. Her daughter Amita Chandekar has also acted in some famous TV serials like ‘Nach Baliye’, ‘Kasturi’, ‘Kkusum’, ‘Kutumb’, ‘Kyunki Saas Bhi Kabhi Bahu Thi’ etc. but she gave up acting after her marriage with Ritesh Tiwari and settled in California (USA). When asked the reason of any Christian not being the Prime Minister or the President of India even after 67 years of independence, Usha Timothy ji replied that the Christians are often very polite and have simple nature. They never seek more political powers and they keep themselves away from the worldly matters. They have more beliefs in praying and spirituality. But, she also said that she doesn’t know much about the politics, thus not competent to comment minutely upon the topic. Mehtab-ud-din, the author of this article. This entry was posted on Sunday, December 14th, 2014 at 6:22 pm	and is filed under Meri Awaaz Suno. You can follow any responses to this entry through the RSS 2.0 feed. You can leave a response, or trackback from your own site. Btw Usha Timothy is a legend, despite the fact that she was another victim like many others of the monopoly the tyrannic egoistic insecure Mangeshkar sisters held, she still has many hit songs to her credit for those who dont know. Those criticising her better mind their language, she simply exposed the truth about the greedy sisters suppressing new talent. Both Asha and Lata were always paranoid that new talent might overtake them, which is why they stole many songs from other singers. Even Usha has revealed this in many interviews that many songs of hers were dubbed by the sisters. Likewise, the greatest singer RAFI never needed to play politics to stay at the top. He kept the playing field on the male side always fair for all singers, but he managed to always remain on top throughout his lifetime solely on the merit of his irreplaceable god gifted talent. 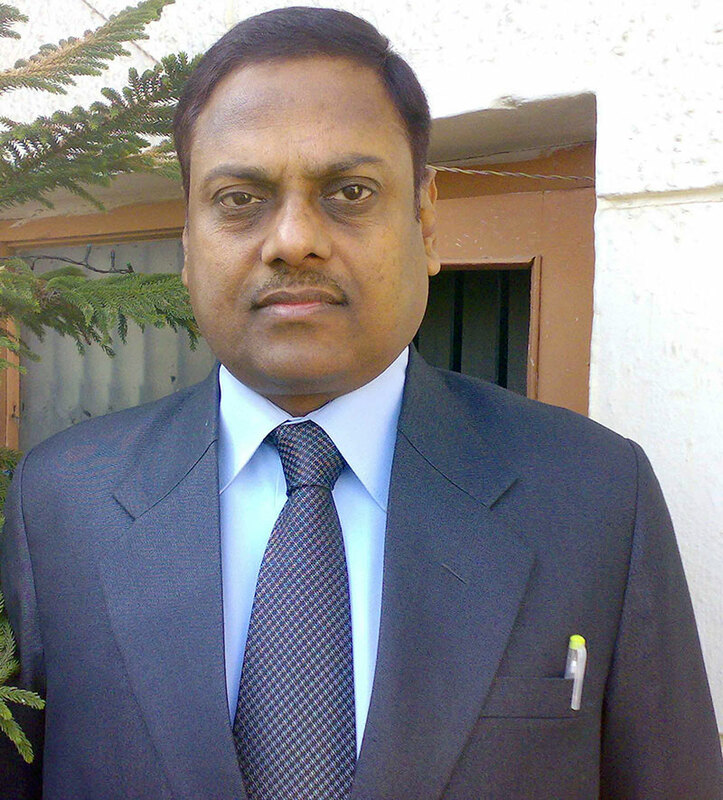 Who is Usha Timothi ? Lataji , Asha ji , Kishore Kumar and Mann Dey were super singers. Agar khuda ki koi aawaj hai to wo hai Mohammed Rafi. Right from my teen age in 1950s till now, whenever I hear the songs sung by Great Rafi Saab,I couldn’t resist temptation to slow down and listen his mesmerising voice. His God gifted style of singing will never fade away from the memories of music lovers. The glorification of one person at the expense of others – seems stupid. Don’t mistake me – am an ardent fan of Rafi as well as of Lata. Like a whole lot of people have commented, when their duets are played it beats all other duets hollow !!! However, people have to be fair – when singers like Mukesh, Talat, Hemant, Kishore, etc. all know and agree about the royalty spat between the two great legends, where is a small fry non-entity like Usha Timothy raising her unsubstantiated and unverified version of the issue ? Do you know how many drawbacks people like SD, Rafi, Asha, Kishore have ? There are so many stories that never see the light of day. BUT, because the lady reigns supreme, she is made a general free for all bait ? Come on, folks, play fair….. Very nice and interesting article. Thanks for sharing these valuable insights. I myself did not know of Mrs. Usha Timothy and her relation to Mr. Rafi – your article will most certainly make me look for some Rafi/Timothy duets. It’s amazing that every new insight of Mr Rafi’s life only confirms the picture of his beautiful personality. Like most Rafi fans I’m not too fond of Lata’s egoistic behaviour. I maintain the position that many people from the music industry keep from commenting/sharing their views on this aspect because they are afraid of the consequenses. But Lata’s days of influence are coming to an end very fast and soon more people will speak their mind and the artificial fairy-tale aura, that she and her sister have, will crack. Thanks again for a very enjoyable article. people could see and hear the legend. Anyway he is always alive. Maybe industry politics and stress took his toll on his health. Wish he kept low for 3-4 years during troubling times and then bounced back. Rafi sahab really need not have settled his dispute with Lata Mangeshkar. When he has singers of the caliber of Suman Kalyanpur to sing with, why should he have bothered? But it would not have been in the nature of Rafi Sahab to hold personal grudges. In the words of O P Nayyar, Rafi sahab was a “thorough gentleman” and “very professional”. Because he was a thorough gentleman, Rafi sahab could not have refused Jaikishan’s plea to settle with Lata. And because of his professionalism, he could not have carried on a petty dispute that would ultimately harm his profession. Today (Dec. 24) is Rafi sahab’s birthday and I will be glued to the radio all day, listening to his immortal voice and the many flowing tributes. I do not want to say too many negative things today, so I will reserve my comments on Lata’s unprofessional conduct for another day. Ultimately, USHA TIMOTHY ji. has exposed and brought out the truth what she did know. What she says is correct as Ms SHARADA, ji, (titli udi fame) has also, in an interview shared this aspect of blocking new singers to sing and SUMAN KALYANPUR JI AS WELL. LATA JI undisputed nightingale singer whom I adore and love all her songs as MOHD RAFI AS SINGER KING and LATA is queen. But she should not had this much of narrow mind and she should have learned from MOHD RAFI’ attitude who encouraged, helped, guided the new singers whoever came into SINGING WORLD. MOHD RAFI was great, humble, competent, and kindhearted GOD GIFTED VOICE, we would never get such person in our life. THANKS TO GOD who created him for us. As a matter of fact we should learn his character, habit, love towards human being and profess them to live a quality and best life. I also heard from a friend from DEHU GAON who posted a post card to RAFI SAHAB who invited him to his residence and dined with him, such a simple person, down to earth. Today 24th dec… RADIO fm 92.7 airing spl programmes on TANSEN MOHD RAFI SAAB. Interviews on RAFI SAAB AND Rafi Foundation – conducted by RJ Zohar yesterday at Mumbai …..
Happiest day to all Rafi Saab Lovers on this 90th anniversary of Rafi Saheb. Sreejith Ji, couldn’t have said it better myself and I also think by giving the Bharat Ratna to so many unworthy people and leaving out a great legend like Mohd Rafi who not only was a great example for others to look up to due to his lovely nature and kindness towards others but lets not forget he was and for millions still is the best singer ever, this really does make a mockery of the whole award system and the muppets that decide on who get the awards. I’m just wondering when Sunny Leone is going to get the Bharat Ratna and it’s sad to say but it wouldn’t even surprise me if that was the case because the whole system is in dissaray and it needs to be reviewed but I can’t see that happening it’s still a case of knowing the right people in the right places. DISGUSTING!!!!!!!!!!!!!!!!!!!!!!!!!! It’s really disgusting to see the degree at which our country has stooped giving awards and honours to people who don’t really deserve it. I am talking about Bharat ratna which has been given to multimillionaires and politicians who really hasn’t done anything to deserve it. If anybody who deserve the title after Mother Theresa it’s our beloved Rafi sahab who rendered countless soulful songs to unite our nation, to lift the morale of soldiers, to preach the good deeds, to romance, to laugh, to cry and so on. He was an epitome of an exemplary human being who stood for ethos humility and set an example before others.and if anybody thinks that multimillionaires and politicians deserves the title, then I pity them.we should all pitch the voice for gaining momentum to help achieve this noble cause.we all are lead by one emotion that is Mohammad Rafi. Thanks for this nice article and sharing some rare facts about relationship of Rafi Sahab and Usha Timothy Ji. Hindi Film Industry is best known for inner politics and back biting. One very good Female Assamese Singer named Munmi Borah got chance to sing under composer like Annu Malik and film director like Manmohan Desai in 1980s at the early age of 13-15. He did not survived due such politics and she stooped singing like Sharda Ji. Mehetab-ud-din saheb, I perused your article, it gave me immense pleasure. I was not knowing anything about Mrs Usha Timothy ji. How lucky she is. She was very close to voice of God. Thanx for enlightening the fans of Rafi saheb. Very fortunate are those people who have seen or worked with legendary rafi saab. Thank you very much mehtab saab for sharing Ushaji’s singing journey with rafi saab. Kudos to the author on such a nice article! Very insightful article, with lot of first hand interactions with the great personality! The information only goes on to reconfirm the greatness of Rafiji, which we have come to know over the years! I agree with one of the comments that never mind what the issues over royalty was but one thing that comes across crystal clear is that Mohd Rafi never begrudged newcomers a chance and was always encouraging and supporting, obviously this didn’t go down well with Lata. Unfortunately, she has never felt secure and knew the only way to eliminate competition was by any means and being nasty and ruthless was her forte. It would be nice if even in this stage of her life she would come clean and apologise to people in the industry that she has caused so much hurt to, if she did she may even earn some much needed respect for herself. Thanks for the article and how lucky was Usha Timothy to sing with Mohd Rafi, no wonder why she has so many fond memories of the legend! Thanks for a very good article on Usha Timothy and Md Rafi. No doubt it was a great pleasure to sing so many songs with the great Md Rafi sahab by singer who started singing with him while almost being a child. To be inspired by such a great singer does remain a great treasure for a singer throughout her life.Thanks to the writer, since we knew so less about the talented singer Usha Timothy. Rafi Sahab was the greatest singer of all time. Mrs Timothy has shared so many unknown stories about the great soul. We are thankful to her for this sharing. It is a universal truth that despite her all efforts Lata was never able to reach the hight of Rafi Sahab’s popularity and his magical singing. Dear Mehtab-ud-din sahib, Assala mu alaikum. Thanks a lot for presenting us with your excellent article on Great Rafi sahab and his co singer Ms Usha Timothy, special thanks goes to Ushaji for her unreserved narration of events together with Rafiji. A simple eye opener of the greatness of Rafi sahab, who respected all humanity equally (big or small) and the only reason why he remains immortal in the hearts of millions after 34 long years of departure. I am a Bengali (Bangladeshi) having a rich culture of our own, with songs of Tagore (Rabindranath) and Nazrul Islam and a host of others. Despite all these- I am an avid lover of songs sung by Rafiji, may they be in any Sub-Continental language. A few Bengali songs sung by him with his great natural voice became treasure for ever. I started listening his songs as a child, and yet today hardly miss a day without listening his golden voice laced with love, compassion, respect, humility, devotion and all resources those makes human as God’s greatest creation. His early departure made us loosing the greatest soul singer ever visited. May Allah grant him Jannat-ul-Firdaus. Thanks for the clarification by Didi Usha Timothi. I am an ardent fan of Rafi sahib and was sure that there must have been some other reason for the dispute of these two giants, other than royalty. I was a 11 year old boy when the subject song from Himalay ki Goad Mein was a hit song. The group dance sequence still lingers in my mind and also before my eyes ! Thank you once again. Rafi sahab to badshah hai…….unke kahaniya itni haseen aur khobsurat hai, ke we are in unbelievable state that such a pure human ever existed with the voice of God and soul of God. I think this isa great award to mohd Rafi given by Usha Timothy. Thanx lots for such beautiful articles . usha ji and rafi sahab keeping excellent repo between two of them. I was so crazy on his voice while sleeping and moving in my daily activities his songs move over my mind like i breath with his song, and Rafi saheb with me always, He was in my heart and still his voice breath in my heart. You supply best article about him I always like to know about him, Love him from my heart and prey for him from Allah Almighty to bless him In Jannat ul firdous. I still remember Rafi saheb. When I was young in school I bunk the classes to see him at Tardeo recording studio and on so many occassions he took me inside the studio to watch him recording songs. After reading this article, tears comes to eyes as today he still lives in my heart. Today we have the best of technology but no good music composer and singers. Bundle of thanks for the article. Today we the Rafinan Fans hv come to know the true cause of fracture/cracks in relations between Great Rafi Saab and Lataji. Undoubtedly Rafi Saab helped every one who needed it as he was not an ordinary human being but a massiah of Almighty GOD. But unfortunately all great men/women(those who think themselves as great) can’t digest this attitude which Rafi Saab had. He was not only the best singer but a thorogh gentleman, soft-spoken, polite and cultured person. God has given such unique qualities not to all but to one who richly deserves it and Rafi Saab is number one to have the blessings of God. Once again my rich regards and thanks to you for the article which has given a new light. Keep it up. God bless you. Fabulous writing on these two great personalities. Asalamu Alaikum Mehtab Sahab Thanx For Sharing Great Article About Rafi Sahab ,Thanx To Usha Timothy Ji For Sharing Information About Rafi Sahab ,Take Care!! Lata mangeshkar has never allowed entry to her opposition any good female singer,in fact she wanted to remain with her monopoly in film ind. In the year 1942 when noorjahan (of awaj de kahan hai duniya meri jawan hai)begam was the topmost singer,lata was of age 14 yrs.but she encourage her And after partition of india she shifted to lahor. Lata though her voice is superb,but she is highly egoistic and jealous by nature. Once My brothe has organized the program of hazara singh in deolali those days i was student.program was grand success. I always suspected there was more to the story of royalty dispute between Rafi Saheb and Lataji. Thanks to Usha Ji for shedding light on this matter. Her stories of Rafi Saheb are invaluable. I liked this article very much. I always suspected there was more to the story of royalty dispute between Rafi Saheb and Lataji. Thanks to Usah Ji for shedding light on this matter. Her stories of Rafi Saheb are invaluable. I liked this article very much. Thanks BS Manglamurty Sir. Your co-operation is very much needed. congratulations Mehtab sahab for such nice and informative article. Worth treasuring. « When Melody Queen was proved dispensable! !